It's funny how inspiration works sometimes. I had made a number of trips during January to the Southern Sierra with unusually low snow conditions, having had a great time roaming around the hills in the area. A storm system came through in the beginning of February which I assumed would cut off access to many of the roads with a fresh layer of snow. Matthew had been inspired by my reports to pay a visit himself which he did over the the long Presidents' Day weekend, also reporting excellent conditions with low snow. This in turn inspired me to give the area another look - perhaps it hadn't snowed there as much as I had assumed. And so I found myself heading to the Sierra once again at the end of February, hoping I might be able to reach some of the peaks around the Sherman Pass area that I had been denied before. I came equipped with chains this time, expecting they would allow me to drive up and over the 9,200-foot pass. My first stop would be an easier peak that can be accessed most of the year, one I had run out of time for the previous trip. Following directions given in Jenkins' guidebook, I drove in the previous night to the trailhead for Yellow Jacket, several miles of dirt road up the east side of the Kern River Canyon. Unofficially named, Yellow Jacket has more than 900ft of prominence though barely 6,000ft in height. It overlooks the Kern River about five miles north of Kernville. The road was steep and narrow in places, carved precipitously out of the mountainside with some serious dropoffs, but negotiable in any vehicle with moderate care. Though not signed in anyway, the TH features a wide, flat turnout that was ideal for sleeping comfortably and made turning the car around a breeze. I was on my way shortly after 6:30a following up the ravine described by Jenkins. The rest of their route description is unnecessarily complicated, climbing out of the ravine and traversing diagonally upwards towards the main ridgeline. This involves more ups and downs and deviations to get around obstacles than is really necessary. I found that simply following the ravine to its conclusion offers a relatively easy route up with minimal bushwhacking. The creekbed was dry and the ravine/canyon shady, making for a pleasant hike in the early morning. Cattle graze these slopes in season and have provided some useful paths to find one's way upcanyon. Just before the canyon reaches a saddle with the main massive to the east, I started up the steep, grassy slopes on the left towards Yellow Jacket. Looking over the saddle to the north one can get a good view of Falls View Peak about seven miles further north with much the same topography as Yellow Jacket (both have a saddle with the main massive, running along the N-S Kern faultline, both are prominent from, and overlook the Kern River Valley). By 8a I had reached the false summit directly above and west of the saddle where I got my first view of Yellow Jacket's summit. From here it's only about 15 minutes of rocky scrambling down to a notch and then up to the highpoint at the north end of the ridge. Unlike my recent visits, there was no smoke to obscure the view looking north, though there was some haze to the south over Lake Isabella. A 2009 register reported that the previous register had been soaked via improper storage and been rendered mostly unreadable. Someone had taken the time and effort to save some of these pages and sealing them in plastic, the oldest dating to around 1998. For the most part the peak sees few visitors, perhaps one party a year on average. On the return I started to follow the ridge south from the false summit, thinking I'd take the route suggested by Jenkins. But I found this somewhat tedious and eventually dropped down one of the grassy slopes on the left and returned via the canyon I had ascended. There was some poison oak in this canyon, but not very much and it was just starting to leaf out making it easy to identify. I was back by 9:30a thinking I had plenty of time for the next adventure. So far, everything was running like clockwork. I spent the next hour driving back down to the pavement and then north and east towards Sherman Pass. I managed to drive to over 8,000ft before being stopped by snow. No problem, I had chains with me this time. It did not take long for things to start to go south. I had used the chains on the van before and was confident I'd have little problem again. To my surprise, I found that the chains were just a tad small and I couldn't latch them closed despite my best efforts. I probably spent half an hour pulling the chains in various directions to stretch them out, but could get the last quarter inch I needed to close them. Another car drove up during this time, an older couple in a small car. I struck up a conversation with them, explaining what I was doing and asking if they had 4WD. Like me, they had only front-wheel drive but were wondering if they might make it to the summit. Without chains, I suggested it was unlikely. The gentleman explained that they just wanted to reach the restaurant at the summit. When I replied that there was no restaurant, they corrected themselves, saying, "Well, it's more like a bar, we think." No, there's no bar, nothing but a parking lot at the summit I went on further, asking perhaps if they meant the place in Kennedy Meadows. "Yes, that might be it," they offered hesitantly, but I dashed those hopes my explaining it was still more than 20 miles away - IF they got over the pass, that is. In the end they decided on prudence and didn't test their vehicle to the unknown snow conditions ahead. This turned out to be wise indeed, because there would soon be no doubt in my mind that they would have been stuck shortly. I went back to my task of trying to fit the chains, but was only further frustrated. I took to reading the sizes indicated on the box and discovered that my tire size was not listed on there. Apparently, when I last got a set of tires, I was given a slightly larger one since I know when I bought the chains that the correct size had been indicated. Ok, but what to do? I was so close. I decided that perhaps if I let some air out of the tire they would shrink enough to make it work. Since I had a tire pump with me, it would be easy enough to pump them back up after getting the hooks clasped. Alas, this didn't quite seem to work either, as I found the tire bulging at the pavement added enough extra volume to offset any savings I had by deflating the tires. Ok, I thought, I can jack up the tire to get it off the ground. So I went about unpacking or moving enough stuff inside to get the jack out and lifted up the driver's side. I found that if I reduced the pressure to near zero, I could just get the chains clasped. Success! So I next got out the electric pump and started reinflating the tire while I went about starting to let the air out of the passenger side. An hour had gone by, but I now had a solution and would soon be on my way. Or so I thought. I had just about completed letting all the air out of the other tire when the noisy pump suddenly went silent. Not good, I thought, now that I've got no pressure in this other tire here. I went around to the driver's side and noted that I had 20lbs of pressure before it had quit. Good enough for this side, but the other side has essentially no air. I flipped the switch off and on and it made a quick chirping start before dying again. Hmmm. Perhaps I had overheated the thing. I read the instructions on the pump and found that they recommend never running it for more than ten minutes at a time. It had been running for about that long I thought. It further recommended letting it sit for 20 minutes before using it again. Ok, so the overheating theory was gaining traction and it seemed I just needed to let it rest to reset the circuit breaker. Stupid pump. I took to reading my book while waiting impatiently, trying the switch again after ten minutes but finding nothing. I set the pump in the snow to help it cool faster and waited the recommended time and then some. After thirty minutes, the pump still wouldn't work. What to do? AAA would be able to help me easily if they knew I was in trouble, but there was no cell service here. I was probably 8-9 miles up the Sherman Pass Rd. It seemed unlikely anyone would be driving up here, though at least one other person had so far today. In the worst case I could hike down the road and thumb a ride to Kernville where I could get cell service and call AAA. That would take the rest of the day to resolve, no doubt, but it was a workable solution. I then got to thinking about the pump more. Not only did the pump not work, but the built-in light didn't either. Combined with the fact that it had started up briefly again suggested to me that perhaps it wasn't an overheating problem, but maybe a loose wire shaken by the vibration of the pump while it's operating. Opening the pump housing required a phillips screwdriver. I grabbed the swiss knife from the van and was disappointed to find that although it was equipped with a corkscrew, there was no phillips screwdriver. Rats. I went through all the compartments in the van to see if I'd stashed some tools anywhere, but of course I hadn't. I then remembered I had another swiss army knife in my pack. This one, to some surprise, had the screwdriver I needed. I took out the five screws and removed the back before starting to look around at the wiring. Almost immediately a broken wire jumped out at me. Normally I would get out my soldering iron in such a case, reconnect the wire and be on my way, but of course I had no tool handy. As a kludge, I figured if I could strip off enough insulation, I could probably just twist the wire around the connection to get it to work. Using a knife blade, I stripped an inch of insulation off, twisted the wire strands together, then twisted the bare wire around the connector it had broken off of. Voila! I felt like MacGyver. Two and a half hours later, I was finally on my way again. I drove easily over this first significant patch of snow and got perhaps a mile up the road before finding a shaded section with far more snow. I drove into about 8" of snow and got stopped with the wheels churning slowly, but going nowhere. Ouch. I put the car in reverse and was happy to have it dig it's way back out. I got out to examine the road. Someone else had driven in before me, getting perhaps five feet further before getting stopped. No one had made it past this point. Perhaps if the snow was frozen I might be able to drive it, but that was a risky venture at best and besides, it would be well into the night before it was cold enough to refreeze. While I was musing how Matthew had found conditions manageable, I suddenly realized he probably hadn't come up over Sherman Pass but had taken the Canebrake Rd on the east side of the range. Doh! I hadn't even thought to ask him about this (but did later). Well, here I was, about a mile further than the last time I had come up here, but far too committed to drive all the way around to the other side. Besides, the peak I wanted most was Sirretta North which was still easier from this side of Sherman Pass. I had an additional advantage over last time in that I had also brought snow shoes with me, something I could have used the previous month. Doing some rough calculations on the route and remaining daylight, I decided I could probably get to Sirretta and back just before, or perhaps just after the sun went down, depending on conditions. I quickly gathered up my gear, strapped on the snowshoes, and headed out. Sirretta North is just under 10,000ft with almost 1,700ft of prominence. It is just three feet higher than the SPS summit of Sirretta Peak, less than half a mile the south. 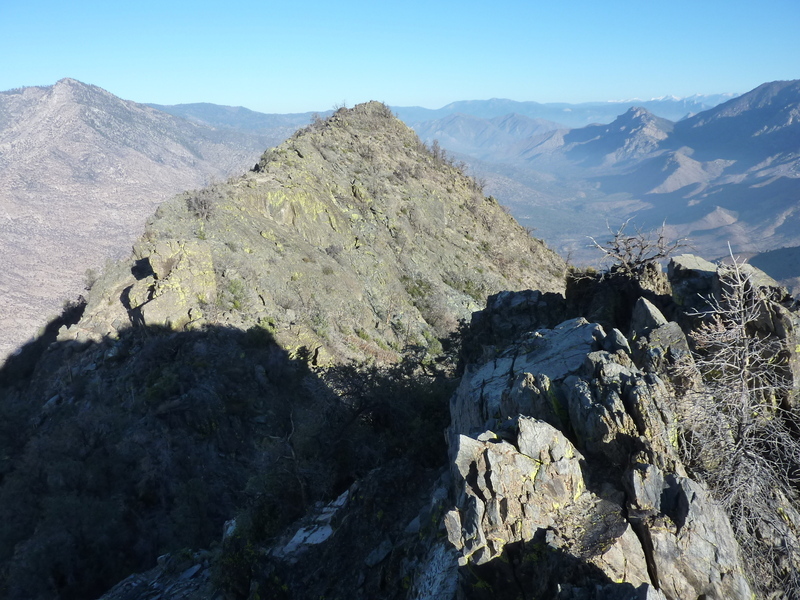 Though pretty much unknown, Sirretta North is the highest peak in the Southern Sierra south of the Golden Trout Wilderness, a stretch of more than 70 miles. It can most easily be reached from the south via Big Meadow, a hike of less than four miles, one way. In wintertime the road to reach Big Meadow is gated closed, making the approach from the north via Round Meadow Rd the easiest, a distance of about 5.5 miles. It was this route that I planned to use with the aid of snowshoes. I reached the junction of Round Meadow Rd and Sherman Pass Rd in about 15 minutes, then spent the next hour hiking along the road to Round Meadow and beyond to Mosquito Meadow. There was 3-6" of snow on most of the road, snowmobiles having conveniently packed it for easier foot travel. There were some dry sections of road that called for the snowshoes to come off, but more than 80% of the route was covered in the white stuff. I passed by several trail junctions along the way and a speed limit sign I would be hard pressed to exceed. At Mosquito Meadow I took a spur road to the left that led somewhat higher than the main road, ending near a ravine where I planned to begin ascending towards the main ridge. From this point I was just over a mile and a half from the summit and it would take me the better part of the next hour to complete the cross-country route to the base of the rocky summit. I left my snowshoes at the bottom of the summit on the west side, then scrambled the easy class 3 rock for the last 30ft or so to reach the highest point. Looking south, Sirretta Peak stands out looking a tad higher, but I know that is an illusion - the two points have been carefully measured by the USGS, or so they have reported. The views are fine in all directions save to the east where trees block much of the view. To the north one can see to the High Sierra stretching from Mineral King to the Whitney Area, almost 50 miles distance. I found a register left by John Vitz in 2010. To some surprise, Eric Su had visited only four months earlier. It's unusual for seventeen year-olds to be seeking out obscurities at such a young age, and I wondered if he perhaps climbed it by accident while looking for Sirretta Peak as had been done by at least one other person who signed the register.